Funk music has long been a staple of hip-hop. Some of hip-hop's greatest songs have been the result of emcees rhyming over classic funk samples. The relationship between funk and hip-hop, however, is not completely one sided. Some funk bands have begun incorporating emcees into their musical mix. 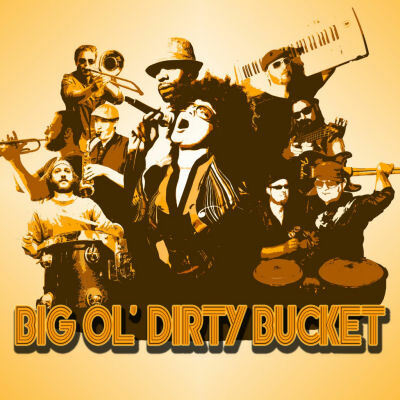 Boston based Big Ol' Dirty Bucket is one such band, as two years ago they invited emcee Lord Micah to join the now ten piece group. On the heels of Big Ol' Dirty Bucket's recently released self-titled debut album, RapReviews caught up with Lord Micah, who goes by Big Daddy Disco in the group, to find out about funk's generation crossing abilities, what Big Ol' Dirty Bucket is like live, and which member of the P-Funk All Stars once joined them on stage. Lord Micah also discussed why he prefers being in a band to being a solo artist, and why doing it all yourself can sometimes be a recipe for disaster. Adam Bernard: You have two names, Lord Micah, and your Big Ol' Dirty Bucket name of Big Daddy Disco? How did you end up with the latter? Lord Micah: I didn't pick that name, I went out one night with a friend, and this lady was drunk and she looked at me and she was like "how are you two friends? Who are you, Daddy Disco?" I almost got offended by it, but when I got home I started thinking about it, and I kinda have a history in dancing, so I was like you know what, she just gave me my funk name. I don't know how she meant it to come across, but I was like, she was drunk, so I took it as what it was. I didn't even know who she was, but thanks. AB: Let's talk a little bit about funk. Why is funk a genre of music that crosses generations so easily? LM: I believe it's because it's the music that came from all these generations. You got people that share this with their kids now, and they can remember it's from classical all the way on up. There's something that was taken from something and made into this. You feel it inside and it brings you right to the dance floor. AB: Let's talk about your live show. What's someone in for when they go to see Big Ol' Dirty Bucket? LM: They're gonna have a feeling like, "what are these people (on stage) gonna do?" We don't look like we belong together on stage, but when we start playing there's a certain energy that drops and it just makes you want to dance. It gives you a feeling like you can't remember what's going on outside right now. For me, even being on stage, it's entrancing. It makes me feel good, and I want to dance. That's the feeling you get. You really want to dance and let go. AB: So leave your bills and problems at the door. LM: Yeah. We all need something that can make us feel good, and we work very hard at just letting the vibe control the love, and the energy. AB: When you put together your self-titled debut album, which was released in June, was the goal to capture that vibe and put it onto a CD, or do you attempt to make your live work and your recorded work two separate entities? LM: We knew that we couldn't make it like the live show. That's the thing about funk, you're gonna hear a song, it's gonna be played the same, but you really don't know what's coming next. That's what the freedom of funk does. We couldn't do that in the studio, so we went in there with a plan. Because there's ten of us in the band, it's really hard to get everybody in at one time. It took us a little over a year to get it done, but we had a plan to get it done that way because we knew we had to capture it as much as we could in the studio. We were very conscious of that. AB: As an emcee you COULD be rhyming over produced beats, going to battles, and be making yourself the center of attention at all times with your work. What do you prefer about being a part of a big band like Big Ol' Dirty Bucket? LM: I did all that, trying to go do everything else and put myself in front of everybody else, and it was just not for me. I always knew that I was better in a live situation, and I love people, so being around a lot of people, and feeling their good energy, pushes me to do stuff I didn't even know I could do sometimes. I dance, so I've always been able to feel the energy around me, and I just pull that into the Bucket. I guess in all terms it's just everybody playing their part, and this is my part in the Bucket. I'm good with that. I know I'll get mine because I'm a good emcee. I'm different from everybody else. That's why I chose that. AB: When you say you're different from everybody else, do you mean in the group, from all the other emcees in the world, or both? LM: I'm different from most emcees in the world, I would say, because my focus is not mostly on me, it's on other people. AB: With ten members I can figure out why "big" is in your name, but where does the "ol' dirty bucket" come from? LM: It comes from the core members of the band. I've been in the band for about two years now. The core members - the bassist, keyboard player, drummer, and guitarist - they have this thing about being in the bucket, and everything was "the bucket," like "yeah that's bucket." When they practiced and had that sound they just knew it was the bucket. As they acquired people to play with them, I was invited down. Everyone that's in the band was pretty much invited down the same way, and it just became this big ol' bucket. It was just if you fit, you fit, and you were in. It was just a natural connection. AB: What has been the most interesting opportunity music has afforded you? LM: For me it's been to meet other people and be able to express how I feel about something, and have them say "yeah, I feel the same way." That's been something that's been a positive thing for me in this experience with the Bucket, and music in general. It's brought me overseas. It's given me a broader view of the world, and I'm looking forward to seeing more people in their own environment. If I could say one thing music's done, it's showed me a lot of love, and how to love others. I'm serious about that, 100%. AB: With all that traveling, and talking to people, you've met a lot of fans. Tell me about your greatest fan encounter. LM: When I was dancing, I was in Japan, and this guy came up to me and he had a video of me dancing here in Boston and it kinda threw me back a little bit, because I'm in another country and this dude has a videotape and he knew my name. That made me feel good, that I accomplished something, and that's what kind of gave me balls to say I want to take it there and do entertainment for my work. AB: That sounds like a wild experience. Speaking of wildness, what's been the wildest thing you've seen, or experienced, while on the road, or in the studio? LM: We did a show with The P-Funk All-Stars and Michael Hampton got on stage in the middle of my verse. For me that was the wildest experience because he got on stage to play with us, and tuned up his guitar, and just worked his way right through my verse and then into a major part of the song. It was real real cool to have that happen. It was a real amazing experience. He just came on stage and wrote a part to our song and it really tore everything apart in the building. It was good for everybody because then he played with our guitarist and they went back and forth, and then he just played the song out with us for a while. We got it on video. AB: What has been the greatest hurdle you've had to overcome, either in music or in life? LM: The greatest hurdle that I have overcome, really, that's a great question because I feel like this weekend I was doing that same thing, and it's self assurance. I feel like that's every person's greatest obstacle. You go through stuff, you have ups and downs, criss-crosses, but overall it's knowing that what you put your mind to you can accomplish, and not just that, you need some help, you can't do it all by yourself. AB: Not a lot of people like to admit that they need help when it comes to reaching a goal. When did you come to that epiphany? LM: I decided, I don't know how many years ago, that I was going to do music for my life, and I said to myself if I'm going to do this then I'm going to take it into my own hands. I started to do promotions. I promoted other people, and I realized I needed some other people to help me, and once I got that we got to a certain point and I didn't really know how to maximize things, and I just kept hitting brick wall after brick wall. After a period of time I had no choice, but having different people I feel God put in my life to help me when I just couldn't do it no more, they were there to help me, and I thought that was an awesome thing. I realized that even in music, whatever I do, I need help, and I need to take, not everybody's advice, but people that I know whose minds and spirits are in the right places advice. This weekend was a monumental weekend for my own personal self because I knew that certain things speed up, slow down, and we try to get control of them like we got control of them, and we don't. It's just good to accept what things are sometimes so you can learn. That was a huge thing for me this weekend, so I'm glad you asked me that. AB: What happened this weekend? LM: I just sat with myself. We've been doing stuff a lot. We've been promoting pretty much this whole two years strong, and we've been promoting the album a lot these last few months leading up to the release, so I haven't had time to really go through what's been happening to me in the last few months. I've gotten laid off of three jobs in the last nine months. Struggling to keep a roof over my head. I have a daughter, strugglin to keep things right with her. Struggling to keep things right with my lady. It's all been caving in on me, and it's just like it was all overwhelming me. I had to come to a realization that I can't do this all on my own. Sometimes I just need to relax and see the people around me, and the things that they've done to me, and see how I can maximize how I was treating them. I'm stressed out, so I really stress on other people, maybe not in deeds or actions, but in words, make them worry about me when they shouldn't. Sometimes it's best just to hold that in because it gives people a different impression of you. Plus you gotta get in control, and ahold, of your own self and realize that you can't do it on your own. That's just who I am. AB: Finally, what's on your Big Ol' Dirty Bucket list? LM: Tour. That is one thing I want to do. I think we got what it takes to bring it on the main stage, and that's what's on my bucket list. Check out Big Ol' Dirty Bucket online at BigOlDirtyBucket.com and find their album at Amazon.com . Don't forget to follow Adam Bernard on Twitter @AdamsWorldBlog and follow RapReviews.com @RapReviews!